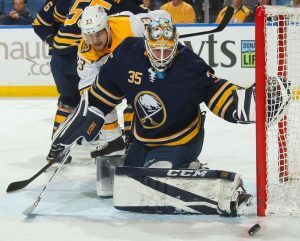 After finishing last place in the 2017-18 NHL season and drafting defenseman Rasmus Dahlin with the first overall pick, the Buffalo Sabres decided to shake things up in the crease and grab some new goaltenders, shipping last year’s tandem of Robin Lehner and Chad Johnson out of Buffalo. The Sabres took advantage of July’s free agent frenzy, picking up former St. Louis Blues goalie Carter Hutton, and former New Jersey Devils goalie Scott Wedgewood. With these additions, and a deep prospect pool for goalies including the likes of Linus Ullmark and Ukko-Pekka Luukkonen, Buffalo looks poised to see an improvement in goal as soon as this year. Here’s a look at their goalie depth for the 2018-19 season. The Sabres are expected to dress Carter Hutton and Linus Ullmark as their two NHL goalies come October. And, due to the general inexperience of both goaltenders, there’s a bit of uncertainty surrounding the crease as we approach the start of the NHL season. Hutton and Ullmark combined share only 164 games of NHL experience, and a modest 72 wins total, 63 of which belong to Hutton. Additionally, neither goalie has been a starter outside of the minors. With Hutton expected to start initially, and groom Ullmark as his backup and an eventual starter himself, there could very well be some bumps in the road. Hutton will face some adversity playing behind a young Sabres squad as a first-time starter, especially coming from the stacked defense core of the Blues, and before that of the Nashville Predators. But, that’s not to say he hasn’t shown glimpses of being a solid starting goalie to date. Last season, Hutton posted the best numbers of his career, as well as the best of all eligible goalies in the NHL, playing 32 games, finishing with a 2.09 GAA, a .931 SV%, and 3 shutouts. 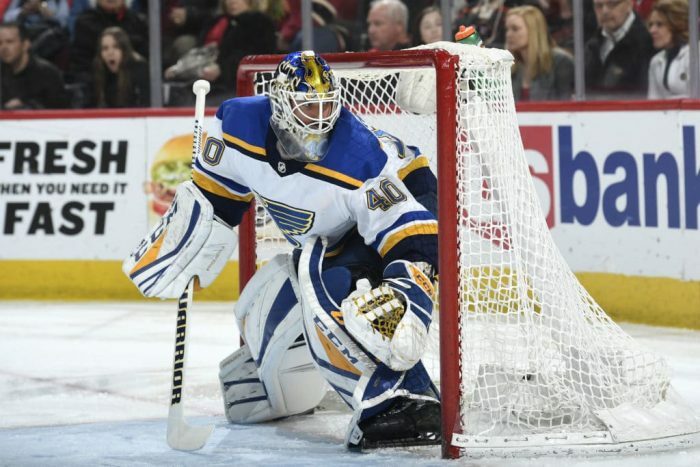 Stepping in for the shaky St. Louis starter Jake Allen for an extended amount of time last season, Hutton carried the Blues and kept them in playoff contention until the very last game of the season, when they ultimately missed by 1 point. That wasn’t his first time acting as interim starter, either. 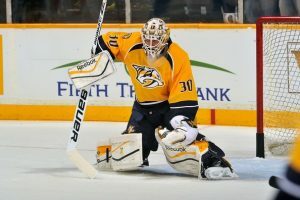 Hutton took the reins for the Predators in lieu of an injured Pekka Rinne in 2013-14, and posted a career high 20 wins. So, albeit a small sample size for the 32-year old goaltender, there is definitely some upside and untapped potential for a good year. The only concern is the recent examples of failure of “backup-gone-starter,” including the likes of Scott Darling. At the end of day, however, Hutton is a solid goalie with a ton of upside and can very well help the Sabres improve in the standings. After signing a cap-friendly 3-year, $2.75 million per year contract, the addition of Carter Hutton is a low-risk, high reward move. The 25-year old Linus Ullmark, who is expected to back up Hutton, is expected at some point to take over the starting job and cement himself as a legitimate starting goaltender in the league. Management and fans alike have kept a close eye on him during his time with the Sabres’ AHL affiliate Rochester Americans, where he has impressed on all fronts, and helped the Amerks to a couple playoff runs. The 6’4″, 221 lb. goalie posted a 2.44 GAA and .922 SV% in 44 GP in Rochester this past season, and even played a handful of games for the Sabres toward the end of their season, impressing all with a 2.00 GAA and .935 SV%. Ullmark is hitting the age when goalies become ripe for the NHL, and start to hit their stride, given the opportunity. The best way to go would be to let him sit behind Hutton for a while and learn the ropes of the big leagues. Fans should expect to see a 50-55 GS range for Hutton, and a 30-35 GS range for Ullmark, which makes sense and gives each goalie a chance to prove themselves. On the AHL front, the Rochester Americans are left with newly acquired Scott Wedgewood, and the young prospects Ukko-Pekka Luukkonen and Jonas Johansson. Wedgewood got some NHL experience under his belt last season with New Jersey, stepping in when Cory Schneider faltered, appearing in 20 games and recording a 3.45 GAA and .893 SV%. Each of the three goalies will probably be given the chance to start for the Amerks, and, much like Hutton, Wedgewood could groom the other two and get them used to the day-to-days of professional hockey. A little bit of uncertainty mixed with a lot of potential makes way for excitement surrounding the goalies this year for the Buffalo Sabres, which is something the fans haven’t experienced in that department since Ryan Miller. All in all, it should be interesting to watch things play out both in Buffalo and in Rochester, and it looks as if up is the only way to go for this organization.